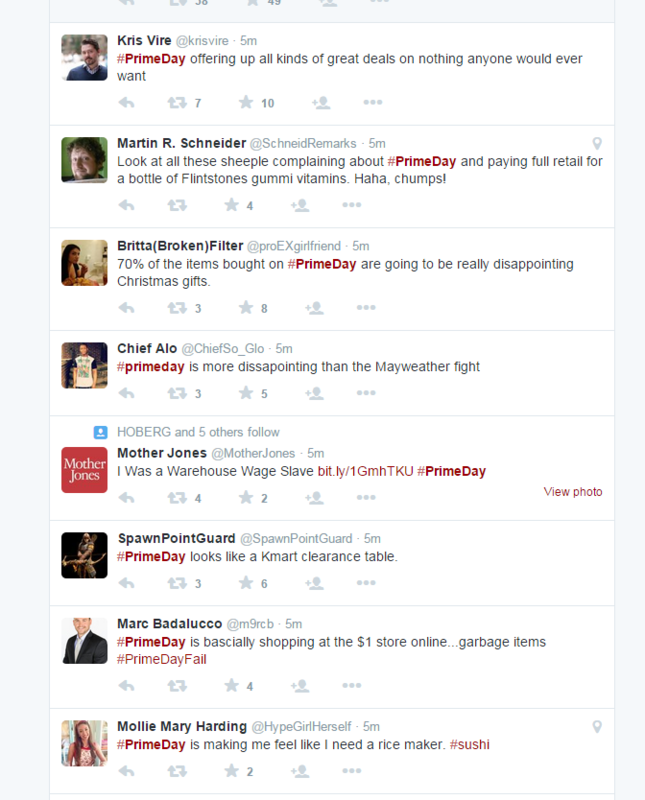 Checking out the Twitter feed, one could think that Amazon has dramatically failed. People are complaining about the mostly lack-luster items that Amazon is featuring as part of the sale. Leaf blowers, knee braces, vitamins – the scourge of the arm-chair consumer will leave no esoteric item unloved. I am no retail expert, but I think Amazon has scored a bit of a coup here at the expense of some minor lack-of-love from the digital peanut gallery. 1. A ton of exposure for Amazon Prime via earned media. These are the dog days of summer. Nothing interesting is happening in the world (unless your world somehow includes areas outside of the U.S. or thoughts that don’t have to do with conspicuous consumption – then there is a lot happening). Amazon basically created an event out of nothing, which generated a ton of press and forced other major retailers, like Walmart, to react, further validating Prime Day. At $99, Prime is neither very expensive nor very cheap. It certainly forces one to think whether they shop enough online (and on Amazon, specifically) to justify having 2-day shipping given to them on every purchase. Amazon wanted to have more people give Prime a go, and what better way to do it, then to sweeten the deal with a “massive” sales-palooza for Prime members. Despite what Walmart may say, one doesn’t have to shell out a penny to take advantage of the sale, as they could simply sign up for a 30-day Prime trial and then cancel. Amazon, unlike other companies, makes it easy to pull the plug and will even remind you via email. So, they very likely succeeded in getting quite a few folks to take the plunge and try the product for free. I am sure that a percentage of these trial customers will convert to Prime subscribers. Some out of laziness or forgetfulness, others because they finally overcame whatever internal barriers they had for not signing up before and actually willingly committed. Prime does make sense for some folks. For instance, in our family, it makes a lot of sense. We just moved to a new city and need to stock up on a lot of things. Being able to order things ad hoc and have them arrive in a day or two makes more sense than driving to Target at the end of the week to do a massive shop for them. Plus we usually benefit from lower prices on Amazon. The funny thing about the angry Tweets is that they aren’t taking into account what Amazon (and other retailers) usually put up for sale on Black Friday and Cyber Monday. It is largely crap too. They are trying to move items that haven’t sold well on price alone. Sure, there are a few loss leaders to generate additional publicity. Amazon had a 40″ 1080p HDTV for under $200 for Prime Day. It sold out. People were pissed. That happens every November and yet nobody stops shopping at Target because of it. Amazon is a digital store. They are masters of big data and what they do with it is the envy of most retailers. By driving incremental traffic to its store (people who usually wouldn’t come to the site), Amazon is profiling a new pool of potential customers who they can message with more tailored product and deal offerings via media channels like display advertising and email. They probably also got a few Amazon app downloads along the way, and with people logging in, they are building more bridges between the desktop and mobile ecosystems, which are notoriously hard to bridge. Remember, Amazon has a media business as well. Knowing more about you gives them the ability to earn money on that knowledge in other ways. So all in all, Amazon pulled nothing short of a coup. They capitalized on a lull in the retail world and got a lot in return. And you know what, the consumer probably got something out of it too. There were some decent deals, especially on Kindle products. For those looking to grab a book on a beach vacation, getting Kindle Unlimited for 40% off is a good deal. Ditto with the actual reader, and a bunch of other things. And just because the majority of the people might not be interested in leaf blowers, it does not mean that a sizable minority were excited to save some money on something they were going to buy anyway. 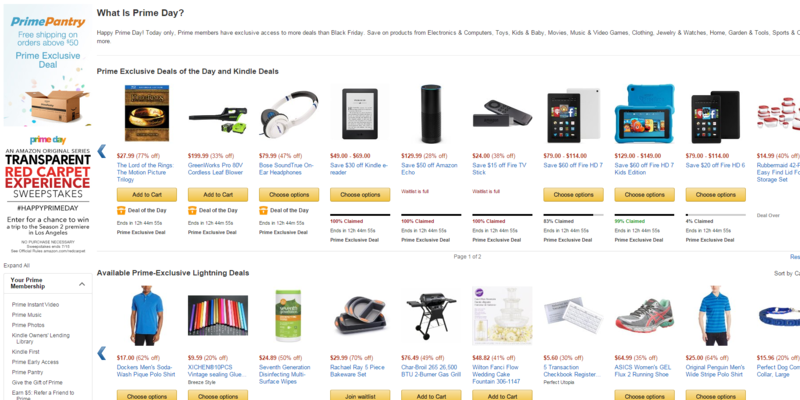 Prime Day was not a brand building exercise for Amazon’s master brand. It was a customer and data acquisition push for Prime and a suite of related and unrelated products that exist under the umbrella. I don’t know if Amazon will reveal the success of this initiative, but my sense is that it worked very well for them.